Everyone's rating [Performance] ControlandTouch are excellent. "Clear the fore, Receive in the back", all-round model to control the rally. Yoshiki	（Experience：６〜１０ years）	There is no weak point! It is a racket where no bad place is found! The shaft is not too soft, not too hard, easy to handle, and the head will work, so even a small force will turn it into a big force! As it is still a duo, backhand tends to fly well, so is seven as well! It feels good to say God racket that corresponds to all scenes! Because it is even balance it is easier to control and smash can be struck comfortably. Receiving can be returned easily. I think that it is a racket that corresponds widely from attack to defense, so I recommend it to those who have difficult fields such as smash and receive! It is also recommended for people who are not confident in backhand! I believed in the reputation of the street and tried purchasing. 3 UG 5 Because it is a product of 7 series it is easy to use for all rounds. There is no habit behind the appearance. The balance feels heavy thing around the middle of the shaft. At first I felt the racket itself heavy than I thought. The shaft does not feel stiff as it flexes appropriately well. Using this racket was a good thing to be able to have confidence in the backhand drive. Try to hit it and you can strike a fairly good one. It is not a playing system racket, it is a type that gets caught, so some frustrations may appear for people who like playing systems. Even if you make a small gauge, I will not play like a nano ray series. I bought a black one, 7. Because it was singles, smash is not so good, but clearer thanks to IC elactomer, it grew well and I was able to drive the opponent. After that, it was easy to receive because it is a Duora that the control is good. It was a very good racket for me who did not want to be influenced by the weight, because it was not heavy, light and not too heavy as it was from a man. It is not that "what was good", but it is impotent without being unbelievable and "well-balanced". I think that rackets are easy to respond to whatever kind of things, by choosing the goodness of balance, while many other racquets emphasize weight and speed up smashing, while stretching somewhere else. Duora 7 is the first impression that it is easy to receive and clear. The difference between the front and back faces is well appeared. Because the head is light, there is no delay in swinging, because the shaft is so soft that you can fly firmly to the back. However, because it is too tight, force will not be transmitted unless it hits the center of the face. In the case of a man with power it might have the impression that it is too light and cumbersome. Also, in the early rally with doubles, I feel that swinging out is bad depending on the shape of the head. 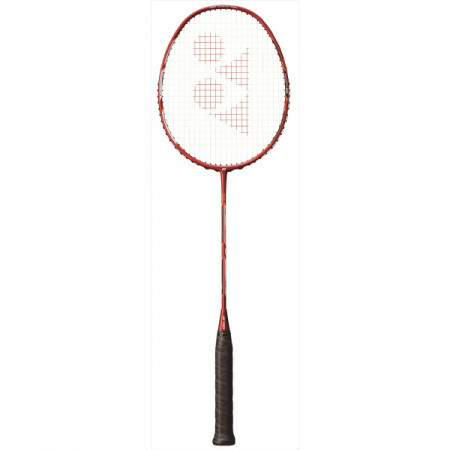 Yonex DUORA 7 Duora 7 as an all round model is easy to use. The wrist did not hurt even during the game, smash was decided with a light touch, so I liked it very much. It adopts different shapes in the fore and bag, so it is easy to beat easily.